Since many of the things we learned while sewing the slip are the same for the undies, today I’m going to add a few new techniques. As always, read through the directions before you start sewing. 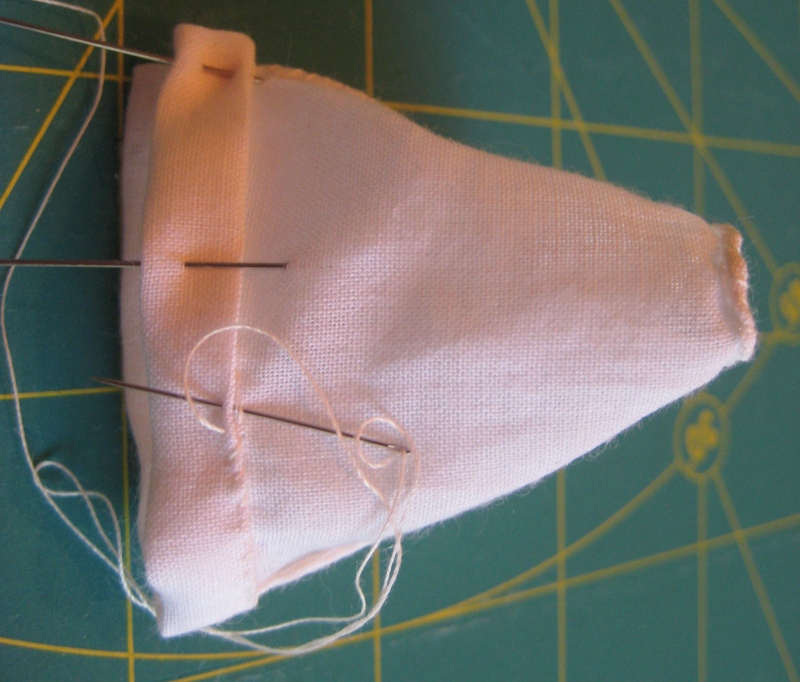 At the end of today’s post, I’ve added two more tips for more efficient hand sewing. 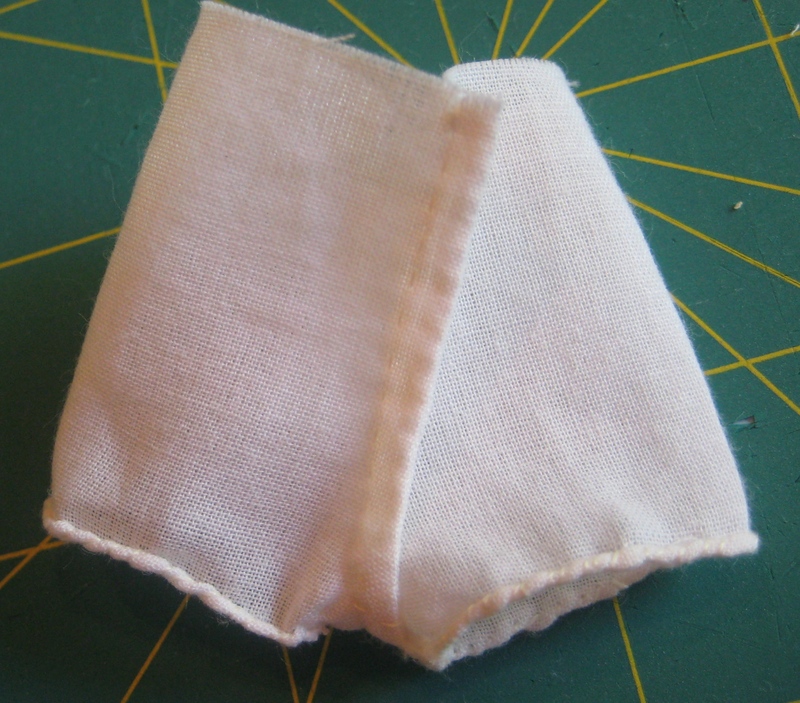 First, stitch the entire front seam of the undies about 1/8″ from the front edge. The front is the shorter seam. 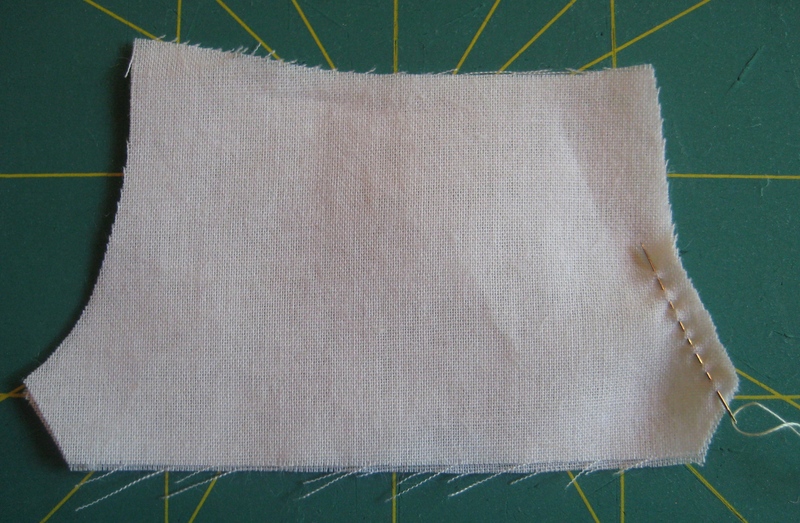 Then, stitch the back seam from the bottom edge to just above the curve and backstitch the end. Stitch 1/8″ to 3/16″ from the edge. 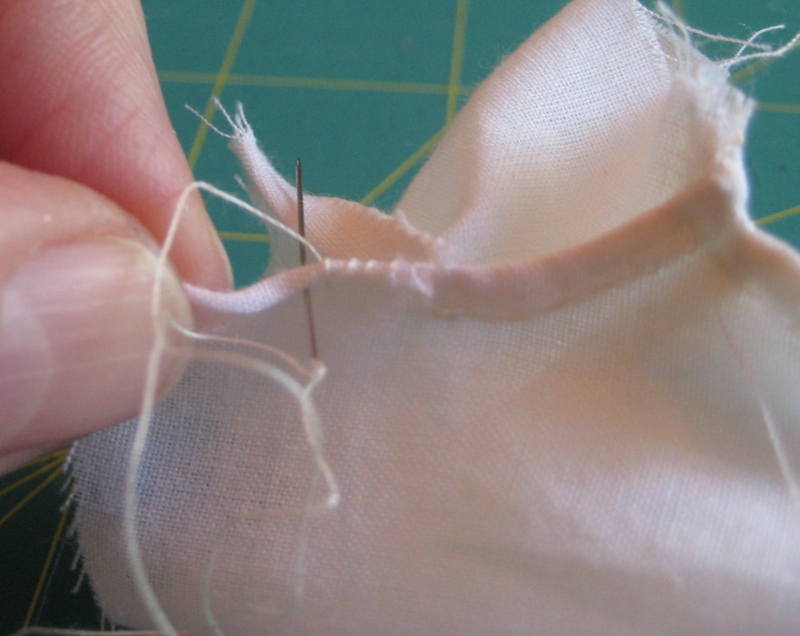 Trim your seams close to your stitching, leaving the unstitched area on the back seam uncut. Remember to snip up to the end of the stitching on the back. 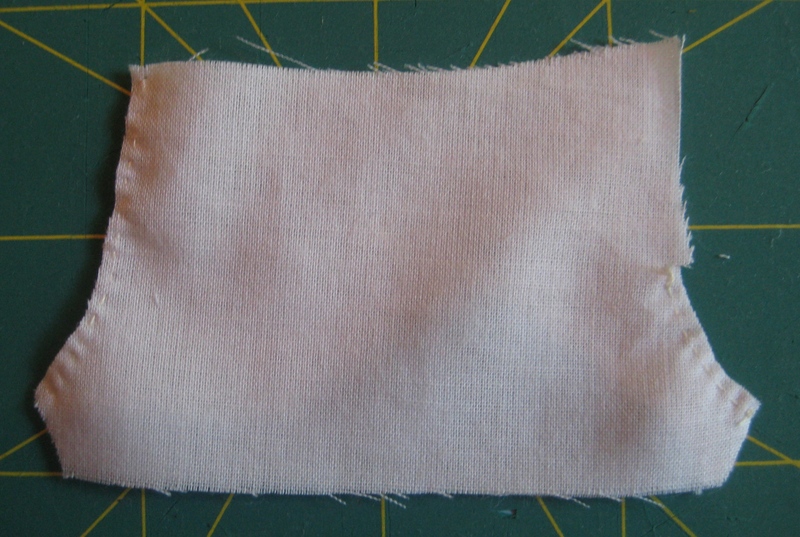 Turn the undies inside out and press the seams flat, pulling the uncut area to the outside. Stitch front and back seams close to the edge, enclosing the cut edge in your seam. So far, this is all the same as we did on the slip. 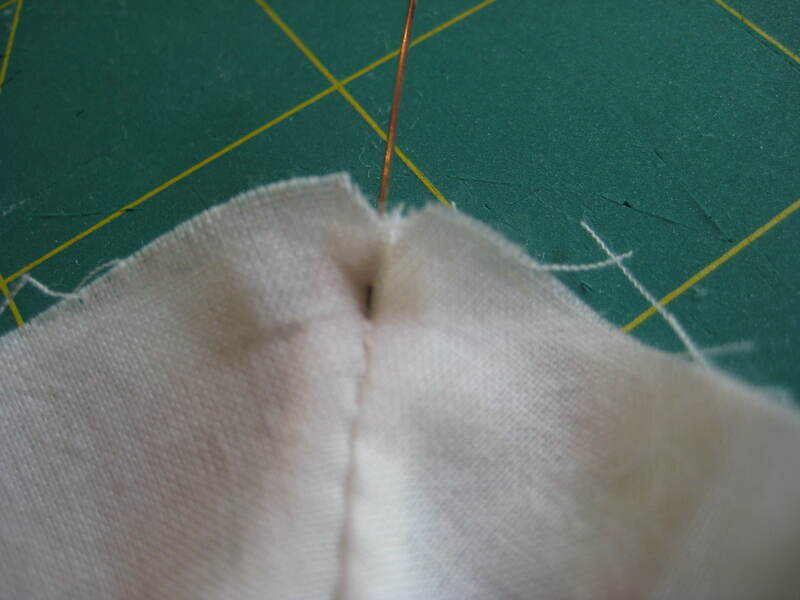 Press the back seam to the left and the front seam to the right. The crotch seam is tiny. 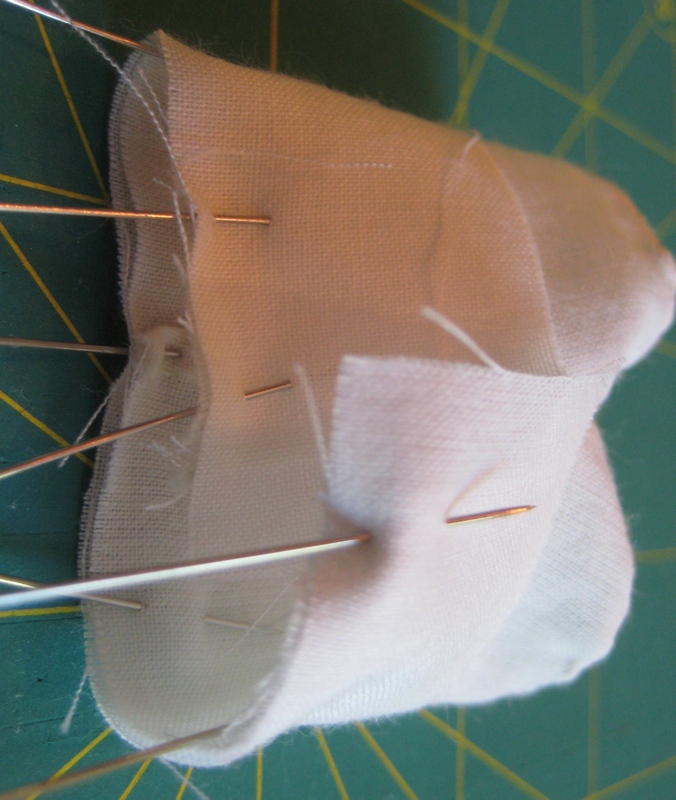 With wrong sides together, match the front and back seam lines and pin. Since the seams were pressed in opposite directions, the crotch seam will be less bulky. 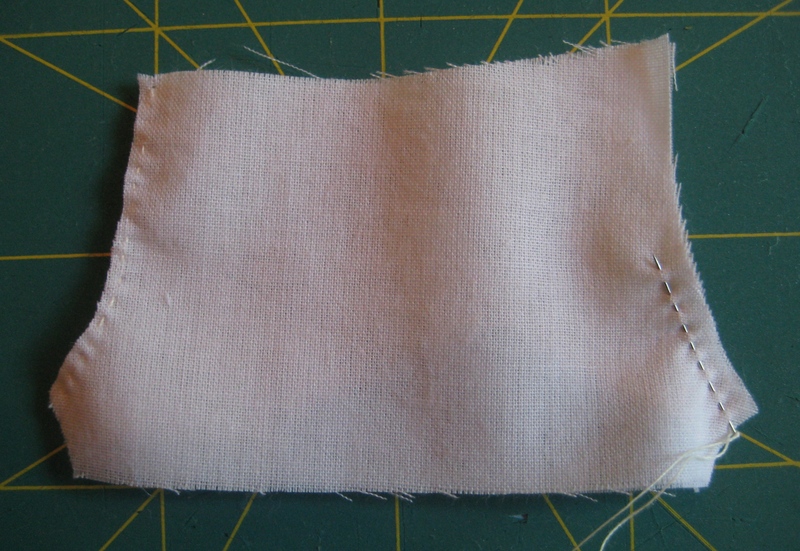 Stitch 1/8″ from the edges. Your seam will form a “V”. 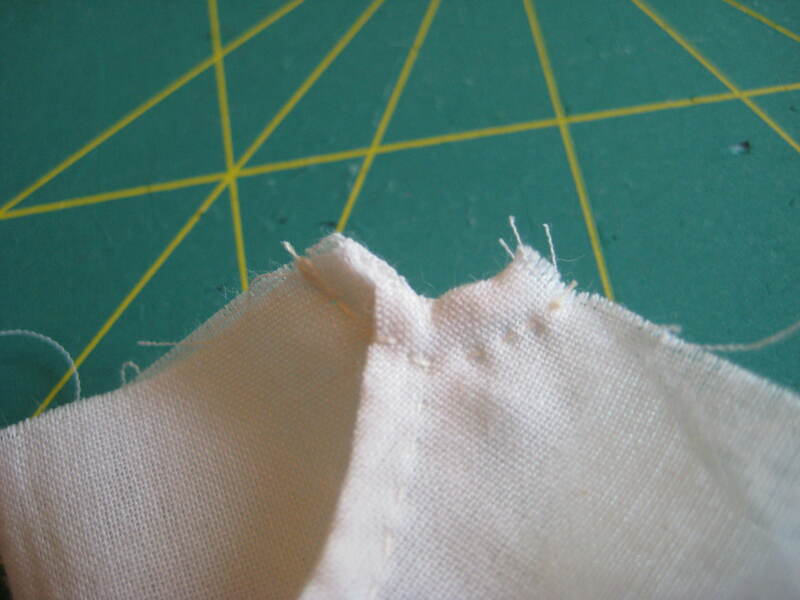 Turn inside out and stitch again, enclosing the cut edges. This is how it will look after it’s done. This is how the finished seam looks from the bottom. The photo on the left shows the inside and the right one shows the outside. As you can see, the seams line up and the seam allowances go in opposite directions. 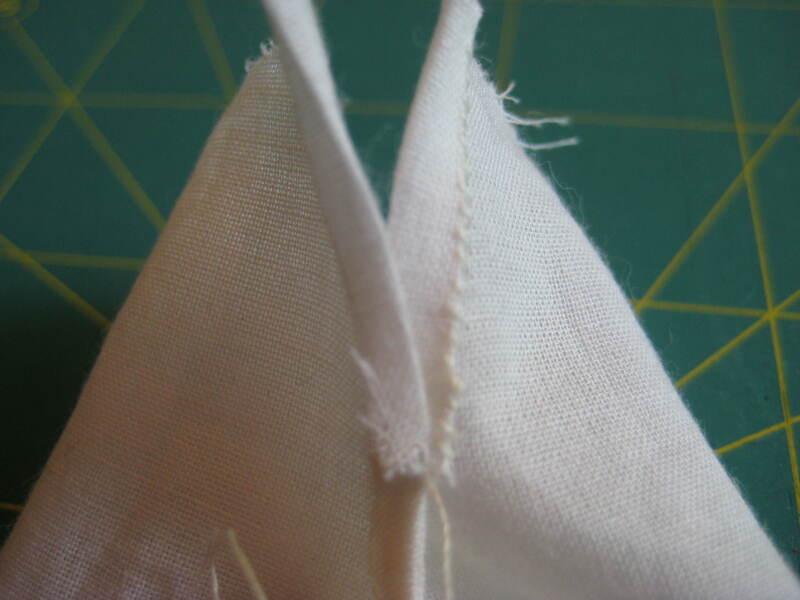 For the back opening, fold and sew the first side just like on the slip. As you can see, since our seams are smaller, it will be hard to do a double fold on the other side, so I’m going to show you how to roll and whip stitch the edge. 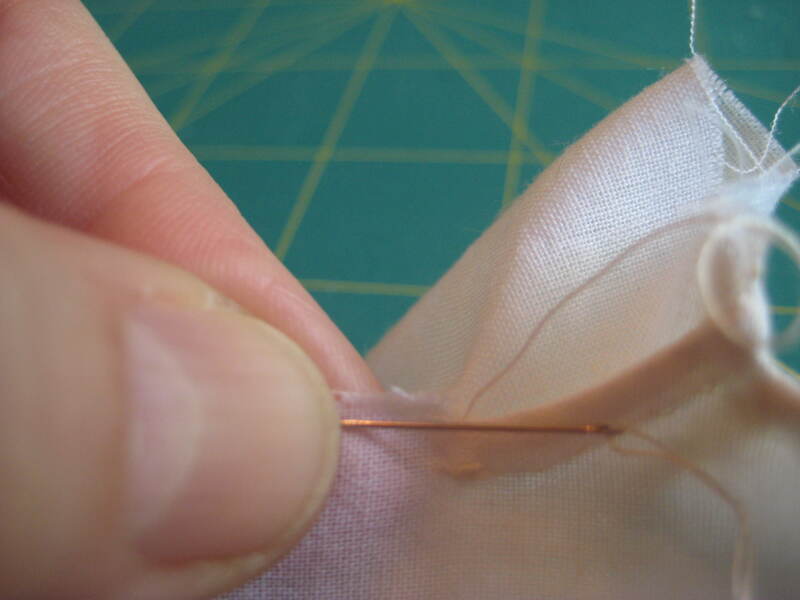 Hold your needle parallel to the cut edge. Dampen your fingers (yes, I use spit) and roll the edge around your needle. 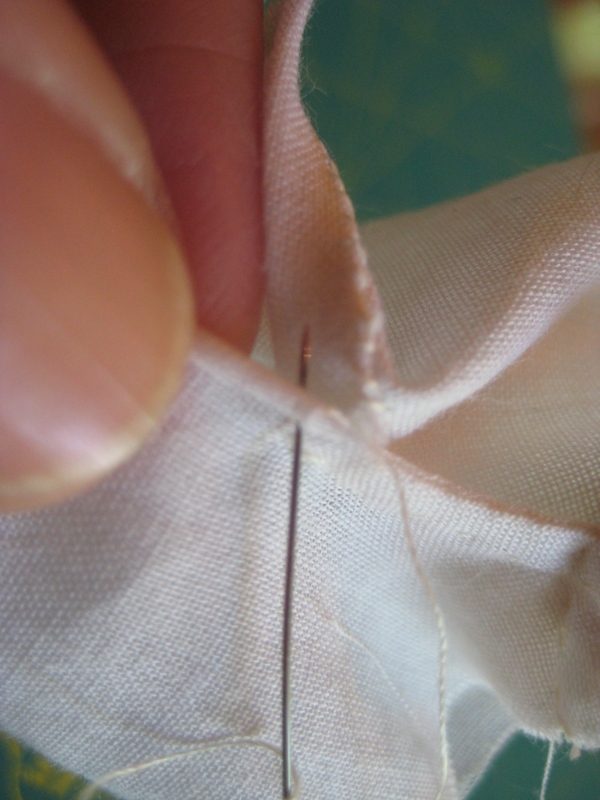 Hold the rolled edge and insert your needle just under the roll of fabric. Continue rolling and whip stitching along the edge to the top and finish off your thread. This is how it looks from the inside (left) and outside (right). That wasn’t so scary, was it? Now, do the same thing for your hems. To attach the waistband, this time we’re not going to gather the waist edge. Don’t trim your waistband, just lay it flat against the right side of your undies and pin. As with the slip, leave 1/4″ free at each end. Stitch 1/4″ from the edge. 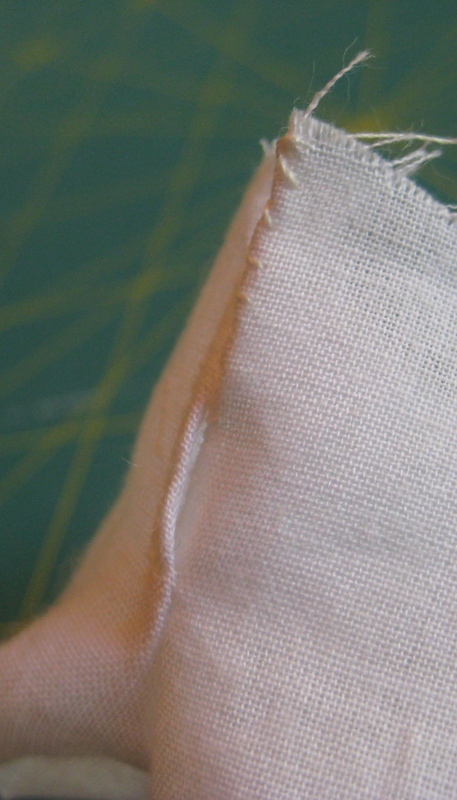 Press your seams towards the waistband, then tuck in the ends and double fold the waistband. 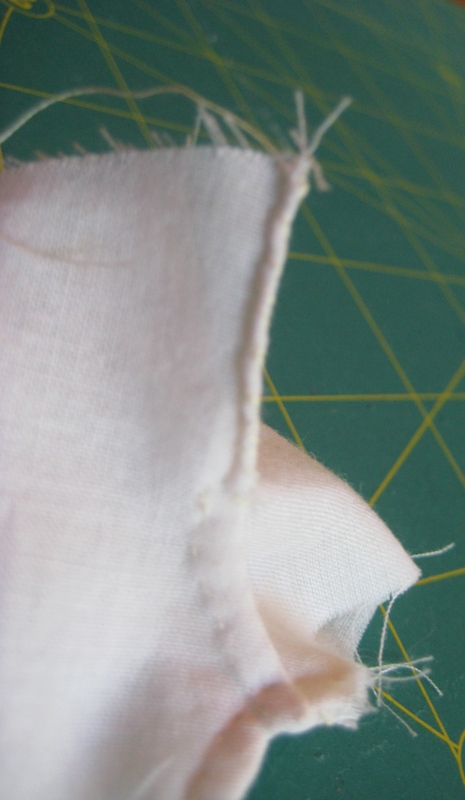 Stitch the inner edge to your seam line like on the slip. 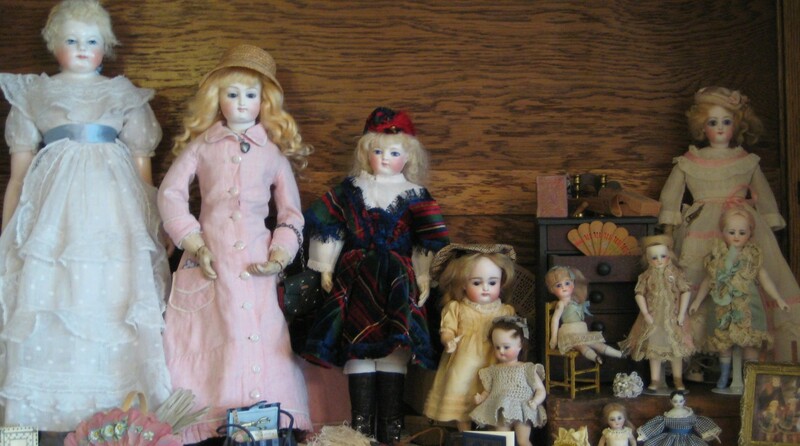 At this point, I test fit them on my doll. 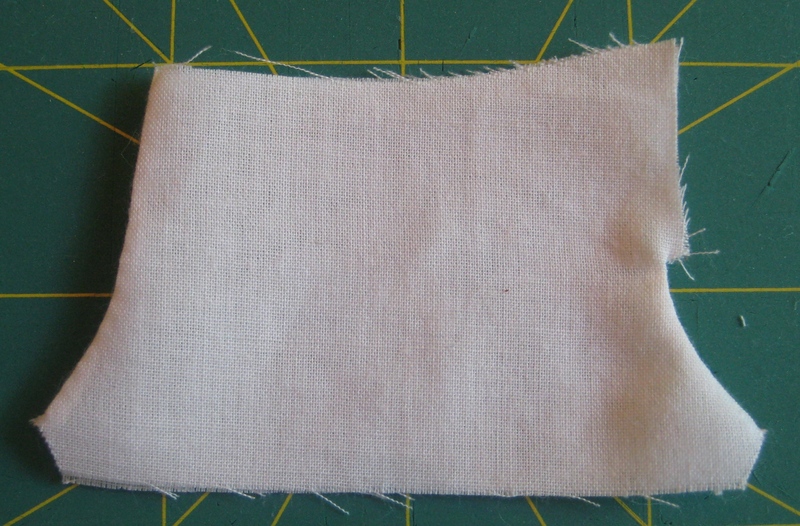 This technique for adding the waistband would not work well on a slip because it would make the waist too bulky when the drawstring is tightened. If you are using lace, stitch it to the edges just like on the slip. I find it is easier to work with one finger inside the leg opening. After the lace is done, insert your drawstring and you’re done. 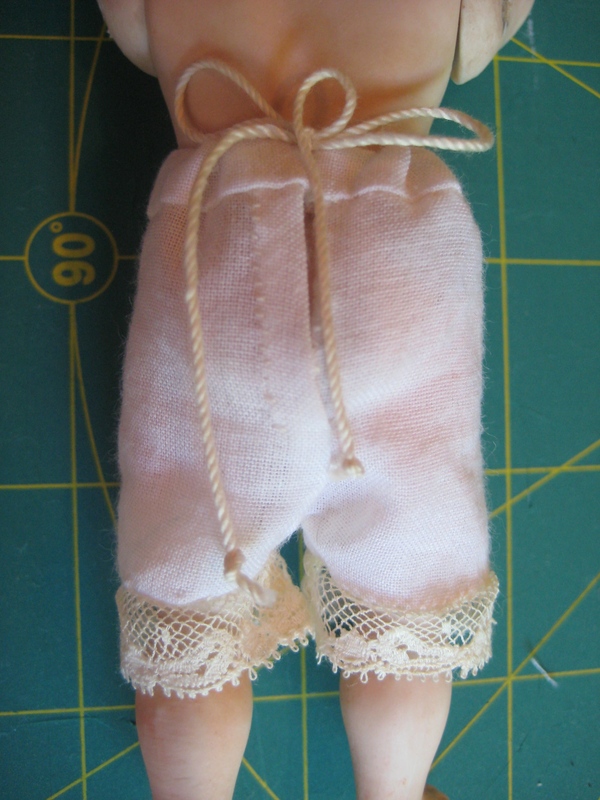 Here’s how the finished undies look on my doll. When I pull the drawstring I keep the fullness to the back. This leaves a smaller gap at the back opening. I did not iron any of the seams, I finger pressed them (see tip below). 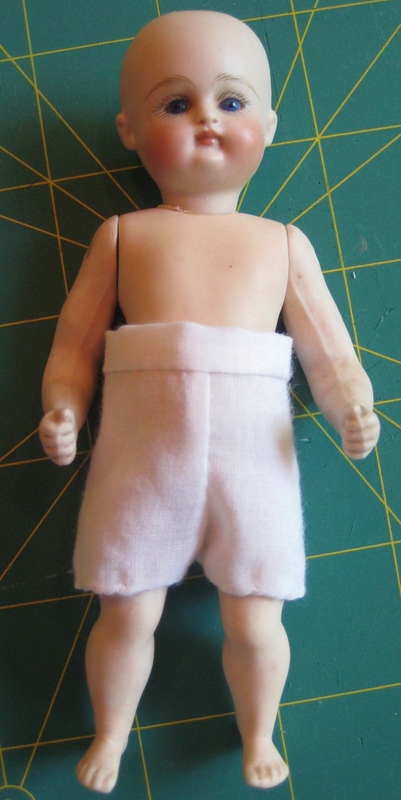 When sewing dolls undies, there are other finishing options you can try. 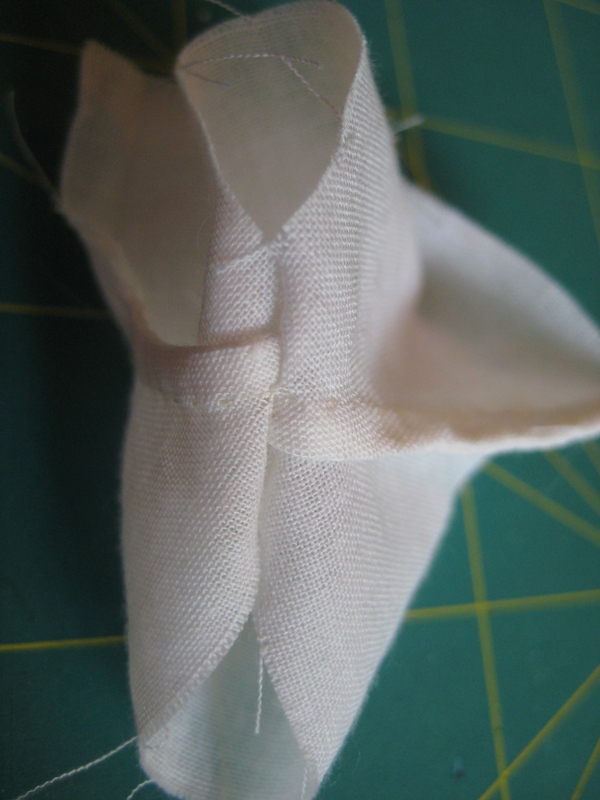 You can cut them a bit taller at the waist edge and just fold the top under instead of using a waistband. If you use a waistband, you can finish it with a button and thread loop or buttonhole. Or you could use a hook and eye or hook and thread loop. I’ll show you a quick way to sew on buttons and how to make thread loops and hand sewn buttonholes soon. Don’t iron as you go. Finger press. When I’m sitting in my comfy chair sewing, the last thing I want to do is keep getting up to iron. To finger press, hold the flattened seams between your thumb and index finger and squeeze for a few seconds. Then move your fingers down the seam until it’s all smooth. If it needs a bit more pressure, run your thumb nail gently down the seam line. 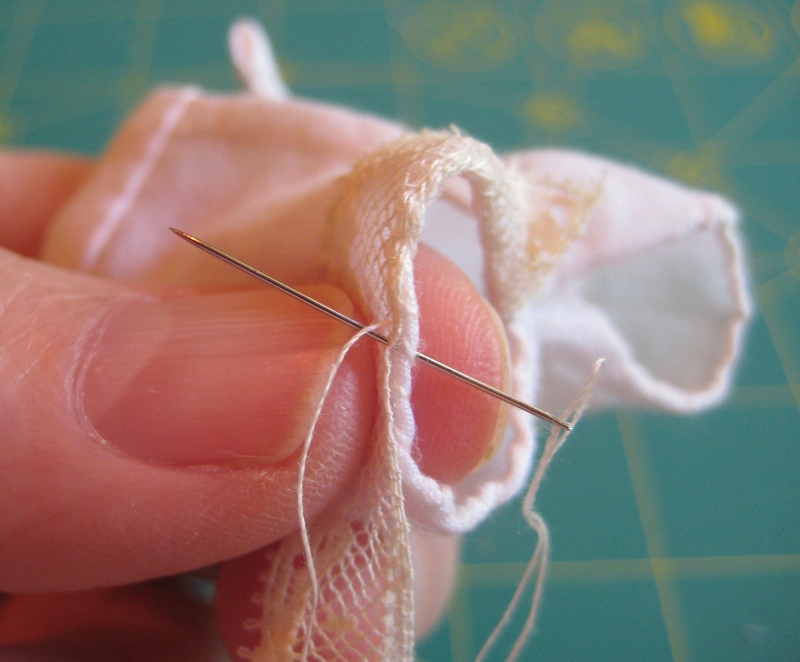 When you snip your thread at the end of a line of stitching, immediately re-knot the end before returning the needle to your pin cushion. 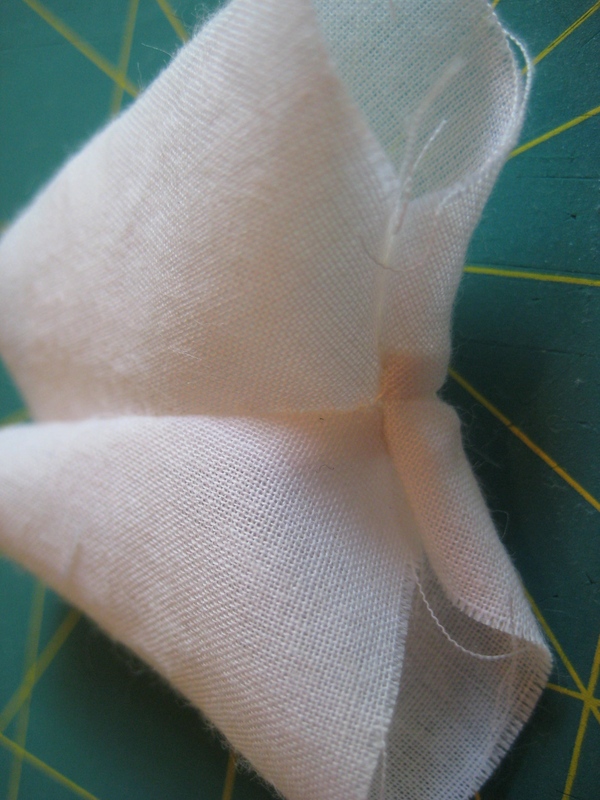 On these tiny garments the seams are short so you’ll be using the same thread for several seams before rethreading. 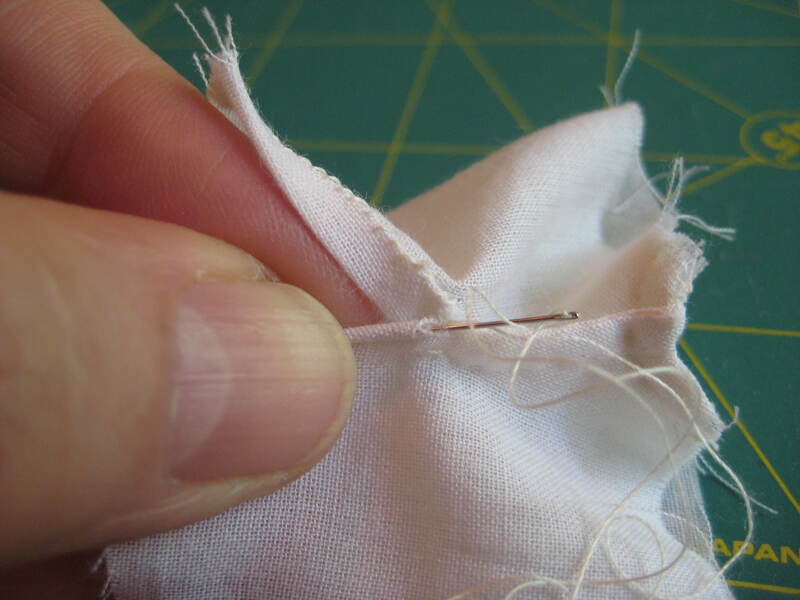 If you get in the habit of re-knotting your thread, you’ll always be ready to stitch the next seam.